Maz Kanata might be tiny but she’s wise, even beyond her years. Known as a “pirate queen”, many traveling smugglers have found refuge in her castle full of antiques and trinkets. Her face was said to be wrinkled by centuries of laughter and smiles, which said a lot about this Force-sensitive humanoid. She likes to keep politics and war outside her castle and has been pretty successful doing that for a thousand years. She’s racked up so many stories, collectibles and characters along the way so it’s no surprise that she’s old friends with Han Solo. She takes interest in his companions, especially because her “boyfriend” Chewbacca was missing from the group. Their visit was far from boring because it ended in a battle against the First Order that leveled Maz’s castle. 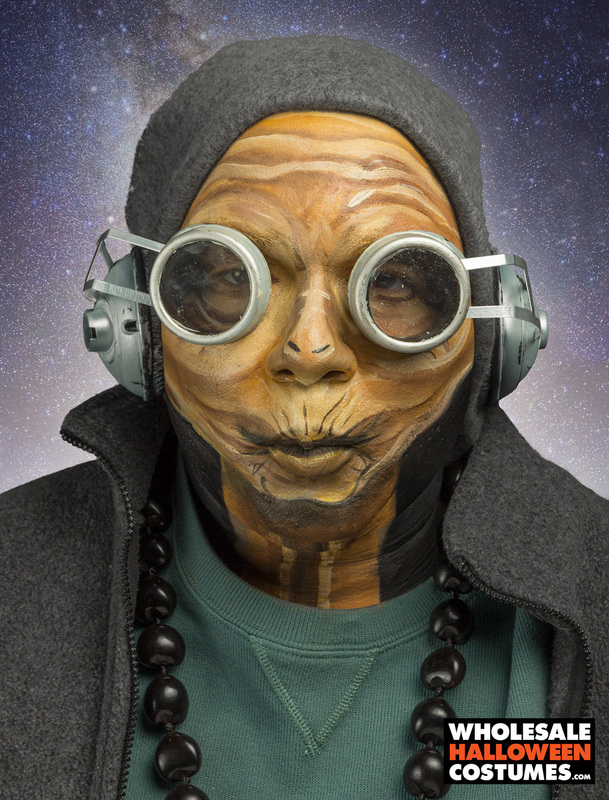 Lucky for us, we haven’t seen the last of Maz Kanata. 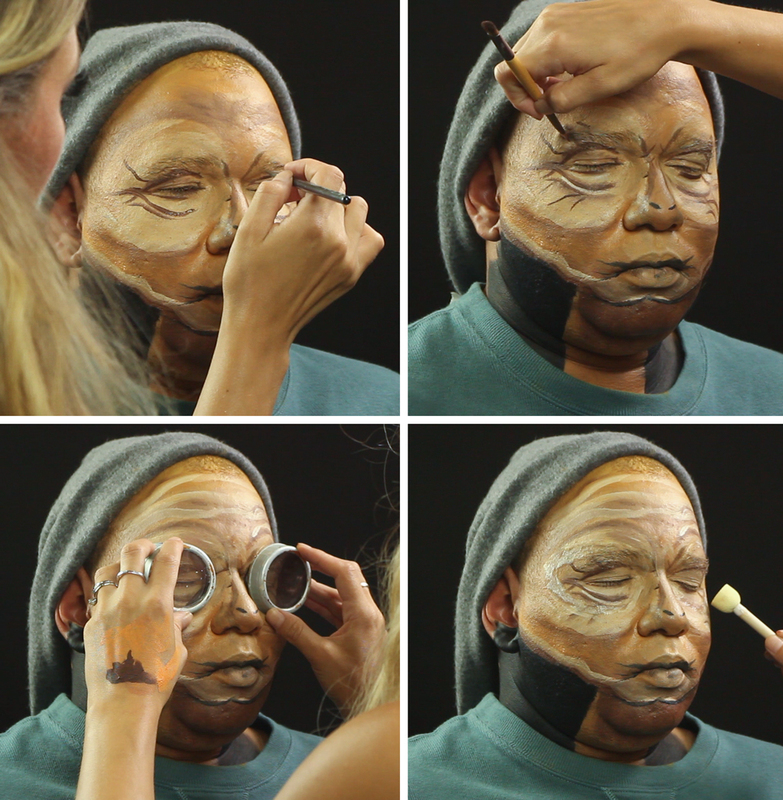 Not only will she have a presence in future Star Wars projects but we’ve created a makeup transformation that will bring her to life this Halloween. Watch the transformation happen in the video or follow along with the steps below. 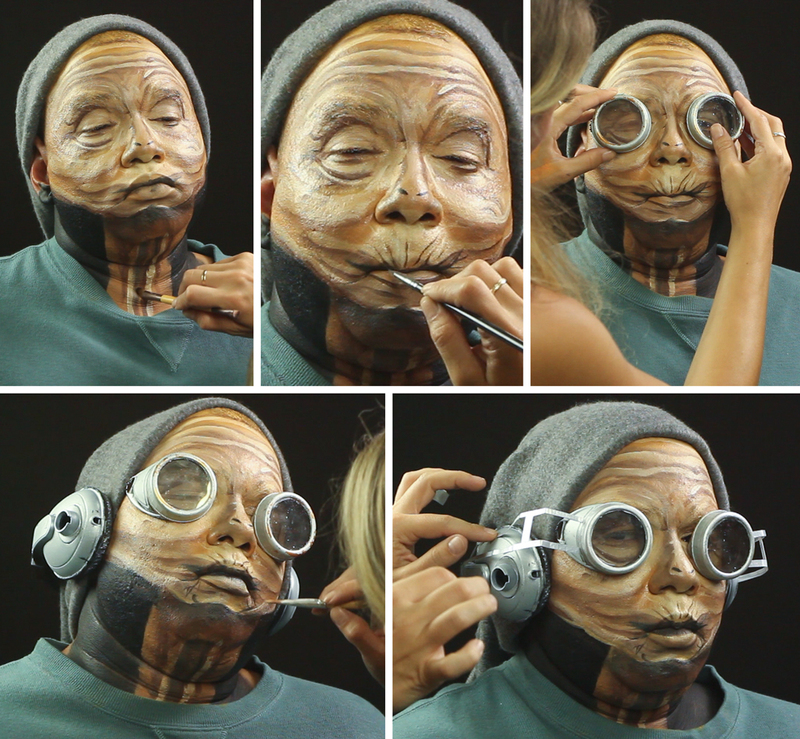 This will be an illusion facepaint, so start by painting what will be Maz’s head. Create her jawline at or just below the lips. Paint Maz’s neck onto the model’s neck. Use black paint to create the space on either side of the neck. This will give the illusion of a skinny alien neck. Refer to a reference photo to start add details and wrinkles. Have the model hold the goggles in place as a guide while you paint the details of the nose. Paint the nostrils onto the bridge of the nose. Because the goggles will be shading the eyes, the overall shade should be light and the wrinkles should be dark around the eye to make them more visible once the goggles are applied. When the wrinkle are complete, coat the rim of the goggles in adhesive, then press them onto the face where they will be applied. This will transfer some of the glue. Apply more Pros-Aide or other adhesive directly to the skin to ensure the goggles will be secure when the glue dries. Allow the glue to dry out a bit. While the glue dries, apply the finishing touches to the shading on the wrinkles, add dimension and shading to the neck, paint wrinkles around the lips. Add the accessories to to complete the goggles. There are better versions out there, but we made ours with old headphones painted silver and duct tape and paper to make the side bars. We might be biased, but we think this look is out of this world. 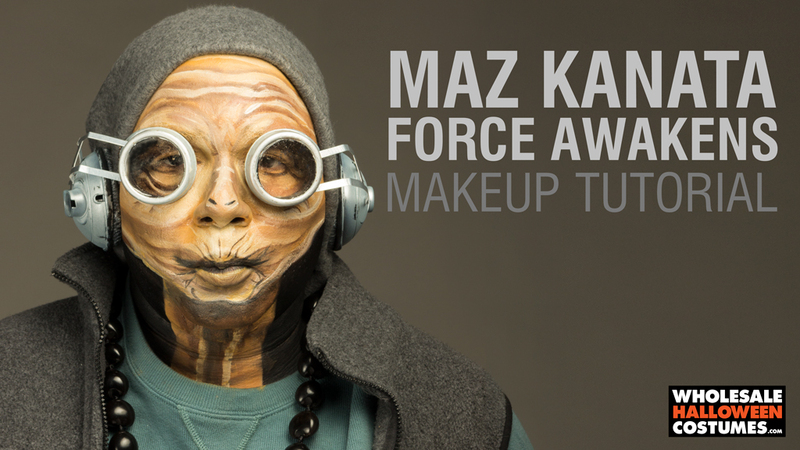 If you recreate this Maz makeup look, you must share it with us on Facebook, Twitter or Instagram using #WHCdoesSFX because there is no try, only do when it comes to Halloween makeup! This look was executed by the lovely Meagan over at The Art of Beauty so don’t forget to check her out!